I have just updated Firefox to its newest version and IDM integration into Firefox stopped working. IDM does not take over downloads from Firefox anymore. What can I do to fix it? Firefox said it had disabled the IDM extension because it wasn't compatible. How do I resolve the problem? 1. Mozilla team updates FireFox browser every six weeks, that's why our team also updates IDM's integration into FireFox every six weeks as well. The latest version of IDM determines the version of FireFox browser, and it will install a required add-on version automatically. Please make sure that you have installed the latest version of IDM. Please use "Help->Check for updates..." (or "Help->Quick Updates" for old versions) IDM main menu item. Then please restart your computer. IDM needs to replace all its DLL files for changes to take effect. Without restarting update will not work! 2. 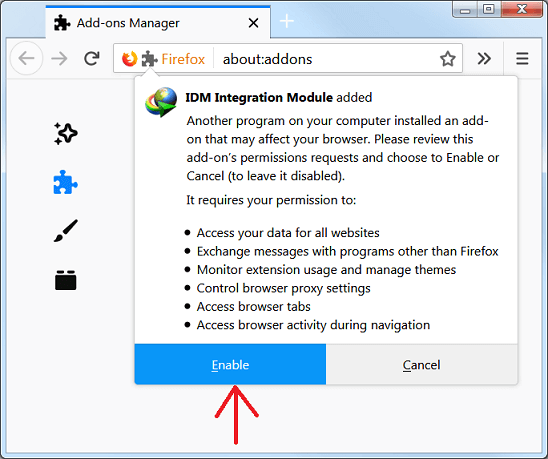 After first installation of IDM, or after updating IDM to the version with the latest add-on, IDM will ask to restart FireFox so that FireFox can find a new IDM add-on. When FireFox restarts, it shows the following dialog to confirm the installation of IDM add-on. You need to click on FireFox options button (arrow 1 on the image) and then on note about new extension (arrow 2 on the image). Maybe you did not pay attention to this dialog during FireFox restart and did not enable "IDM integration" add-on. In such case you need to enable it manually. Press FireFox options button (arrow 1 on the image) and then on "Add-ons" menu item (arrow 2 on the image). "Add-ons Manager" window should open. Click on "Extensions" tab (arrow 1 on the image) and find "IDM integration Module" (Internet Download Manager integration add-on for Mozilla). If it is disabled, you will need to press "Enable" (arrow 2 on the image) and restart FireFox. 3.1. Please note that because of global changes in FireFox 40 we had to make a new add-on for FireFox with a new ID. The old version of add-on had "IDM CC" name, while the new version has "IDM Integration" name. Also please note that because of global changes in FireFox 53 we had to make a new "IDM Integration module" add-on for FireFox. At present time the oldest add-on is "IDM CC" and it supports FireFox browser from version 1.5 to version 26 inclusively. The next add-on is "IDM integration", it supports FireFox browsers from version 27 to version 52 inclusively. And the latest add-on is "IDM Integration module". It supports FireFox browsers from version 53 inclusively. 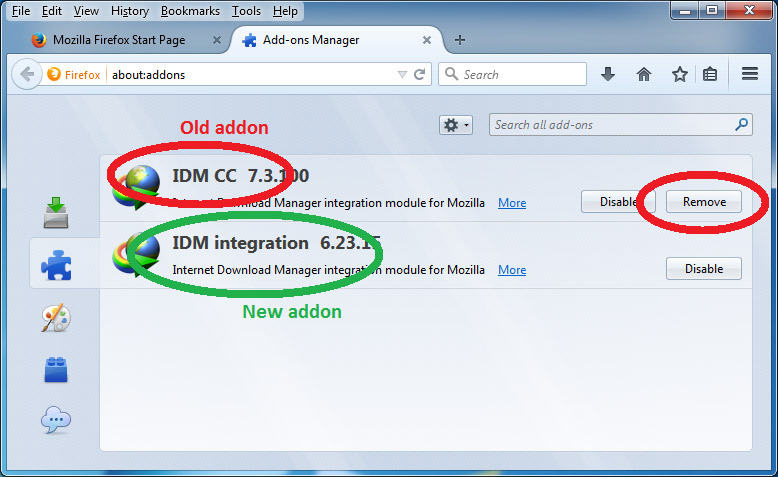 Note that IDM distribution has all three versions of add-ons inside of it, and it's possible that in FireFox settings in the list of add-ons you may see two or three IDM add-ons: the old ones and the new one. Click on "Extensions" tab (arrow 1 on the image). 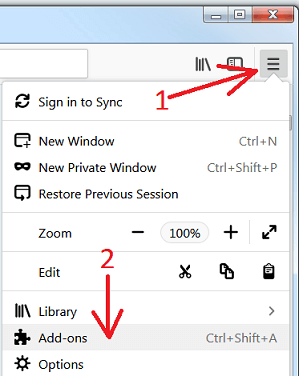 Then press on "Tools for all add-ons" cogwheel (arrow 2 on the image), and pick "Install Add-on from File..." (arrow 3 on the image) menu item. 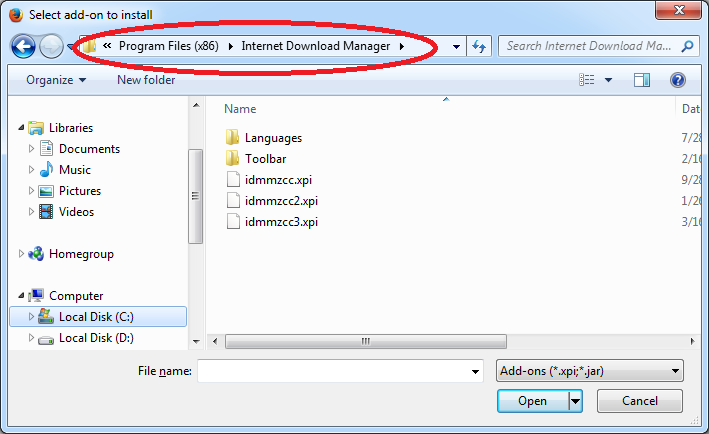 Then open IDM folder where you installed IDM ("C:\Program Files (x86)\Internet Download Manager\" by default). Select idmmzcc3.xpi for FireFox 53 and newer versions. Select idmmzcc2.xpi for FireFox from version 27 to version 52 inclusively. Select idmmzcc.xpi (without a number) for FireFox from version 1.5 to version 26 inclusively. If you selected an incorrect version of XPI file, FireFox would show an error message. If you do not know your version of FireFox, please read here how to check it.